It would be incorrect to say that South African Legion serves the agenda of one or the other side of the political spectrum in South Africa, or that we are apologetic for the purposes of gaining some sort of political currency. We can’t “hide” South Africa’s past so as to promote a political narrative acceptable to one or the other community in South Africa. This incident is a case in point – it’s a tragedy. This image of South African Police bravely scurrying innocent victims to safety in 1980 stands as stark testimony of just how deep the scars run – it’s a deeply traumatic memory for us. Most of us are veterans of exactly what this image portrays; we’ve have seen it first-hand, we’ve “been there”, we “know” violence – veterans who stand at a Cenotaph every year know very well who they remember and what it took for them to be standing in front of the Cenotaph in the first place. In South Africa (like many other places in the world), once peace is achieved – ex belligerents now stand together at those remembrance memorials (whether we like it or not) – each personally remembering a cocktail of the scars, losses, sacrifice, brothers forged in arms, loss of youth and personal demons. 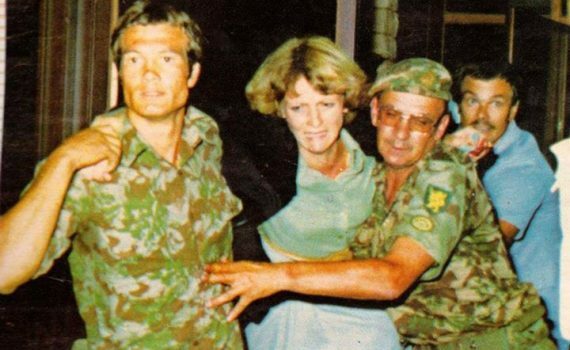 Ex-MK “Cadres” and ex-SADF “Troopies” – many reconciled under the SANDF – all recognized by South African law equally as military veterans – all stand with their standards and wreaths – their war now long ago, their wish for peace now paramount. We are unique as South Africans as our journey stands testament to the world – that basic human and spiritual condition of forgiveness overcomes all. The Truth and Reconciliation Commission heralded an unprecedented achievement – it’s singularly South Africa’s greatest redeeming quality, and one for which we are still honoured with. A little on why this image and this story, to us it powerfully portrays the sacrifice South Africans had to endure during the internal armed insurrections in the 70’s and 80’s. Here on the the 25 January 1980 three Umkhonto we Sizwe (MK) Cadres – Stephen Mafoko, Humphrey Makhubo and Wilfred Madela – were allegedly on their way to carry out a planned MK sabotage mission on petrol depots at Watloo near Mamelodi. En route, ‘the Trio’ realised they were being tailed by the police. In an attempt to escape, they took refuge in a branch of Volkskas Bank in Silverton, Pretoria. They held 25 civilians in the bank hostage, making a number of demands, including a meeting with State President Vorster, the release of Nelson Mandela and a man called Mange, as well as R100 000 in cash and an aircraft to fly them to Maputo.After a series of negotiations, which included the police handing food over to the cadres and hostages, a police unit stormed the bank and all three cadres were killed by the police. Two civilians, Valerie Anderson and Anna de Klerk, were killed and many others were wounded in the shootout. Clearly all South Africans – black and white – were involved in this conflict at the time, from across the political divide – these young MK men left their families behind to fight “Apartheid”, these Policemen bravely putting themselves in harms way to protect the status quo and civilians alike, these innocent victims caught in the cross-fire. All with the heartfelt belief in what they were going was right – and all someone’s hero. As Legion, we stand as testament to the ideals of Reconciliation, we embody Remembrance and we stand to “honour the memory” – and we most certainly stand as ambassadors to Peace. We believe these values supersede “hate”, “division” and “resentment”, so we stand with an open hand and not a clenched one, and proudly so. Article for the South African Legion by Peter Dickens – reference SA History on-line.